Often a question is raised whether it better to be a specialist rather than a generalist. There is no perfect answer to this. It depends on situations and availability of opportunities. As regards choosing a career, generalists have a wider choice However the number of candidates competing for generalist positions is always much higher There are lesser number of specialist job positions and number of people who hold qualifications to apply for such positions is also comparatively less. Whether one wants to remain a generalist or grow into a specialist can be a matter of personal choice also. We all know that our country has more job seekers than jobs available in such a situation it becomes a challenge to get into a job of one’s choice. However with an adjective understanding of one aptitude by being clear about one’s care preferences and adequate preparation, this challenge can be met. You have to be realistic and put enough hard work in stand out in the competition. Banking is one industry which has continuous demand for people as employees. In past 5-6 year maximum number of job opportunities in the country has come from bank. Public sector bank has been a front runner in this. Many young people in our country aspire to work with public sector banks for obvious reasons like job security, reasonable compensation and benefits combined with growth opportunities. 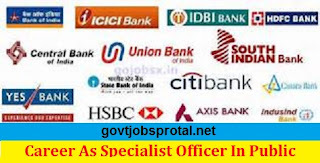 For bulk of job seekers public sector banks are known to have positions of clerks and probationary officers. 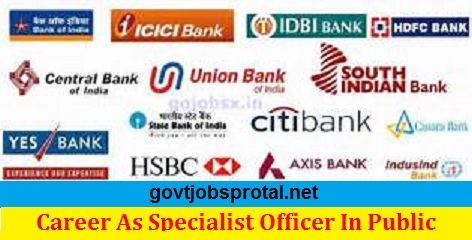 There are generalist positions which are open to graduates from all disciplines however specialist positions are also available in these banks though their number may be much less when compared with opportunities in general banking there may br situations when a person on the basis of his or her qualification is eligible for both generalist and specialist positions. Data of recent year show that many qualified engineers with degrees like B.E. and B.Tech. Have jointed public sector banks as clerks and probationary Officers. However such Qualification makes you eligible for specialist positions as well. To apply for the position of Agricultural officer you should have 4 year graduate degree in any of those subject Agriculture/Horticulture/Animal Husbandry/Veterinary Science/ Dairy Science/Fishery Science/ Pisciculture/ Agri. Marketing & Cooperation/ Co-operation & Banking/ Agro-Forestry/Forestry/Agricultural Biotechnology/ Food Science/ Agriculture Business Management Food Technology/Dairy Technology Agricultural Engineering. 2).Information Technology officer: During decade banking sector has adopted technology in a big way. If you visit a bank branch you visit a bank branch you find almost every one working on computer. Thick huge ledgers have been replaced by digital files. With establishment of core banking platform, banks have been able to integrate their operations. Now it has become possible to transfer funds from one branch to other and bank to other electronically. Banks are making every effort to popularize internet banking, mobile banking and other from of digital banking transactions. Banks have made huge investments in technological infrastructure. This infrastructure consists of date centres, hardware, software, information security and other tools. 3).HR/Personnel officer :- Eligibility criteria for HR/ Personnel officer are simple. The application should have post Graduate degree or two year Full time Post Graduate degree or two years full time post Graduate degree diploma in Personnel Management/ industrial/ Relations/ HR /HRD Social Work/ Lobar Low. A bachelor degree in low (LLB) and enrolment as an advocate with Bar Council is the prescribed criteria for entry level position of low officer. For the posit on of marketing officer the applicants are required to have two year Full time Management degree with specialization in marketing which include. 6).Officer Language Officer: Post Graduate Degree in Hindi with English as a subject at the graduation level will make you eligible for the position of Hindi officer Those having post graduate degree in Sanskrit with English and Hindi as subjects at the graduation level are also eligible. Preparation: The most crucial part is to qualify in the preliminary examination without which you’ll not be considered father your preparation cab be in the following manner.